Full-dress Vtwin flagship with looks and performance! Designed for riders who set their sights beyond the horizon, Kawasaki’s new Vulcan® 1700 Voyager® offers everything needed for comfortable long-distance touring with or without a passenger. 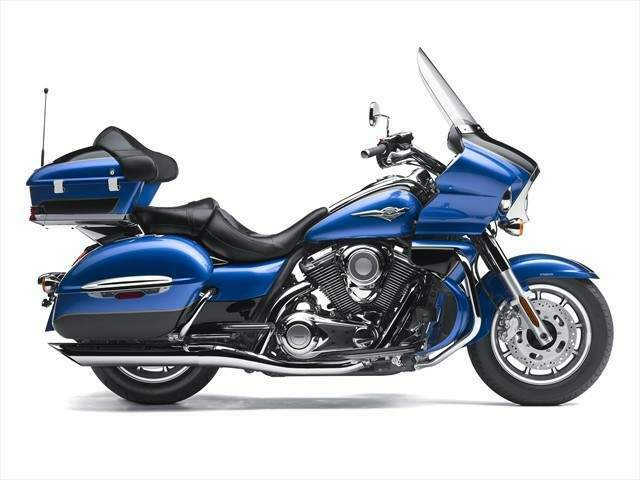 Kawasaki’s first full-dress V-Twin touring motorcycle, the new Voyager features a large frame-mounted front fairing and windshield, ample storage, a new 1700cc, long-stroke, liquid-cooled, V-Twin engine and a compact, lightweight frame. The flagship Voyager is also loaded with the latest technology. Its standard equipment includes Kawasaki’s first fully Electronic Throttle Valve system (ETV), Kawasaki Advanced Coactive Braking Technology (K-ACT), cruise control and multi-function instrumentation with an audio system that’s compatible with iPod®, MP3 players and other systems. The cruiser’s cutting-edge technology is headlined by Kawasaki’s sophisticated new Kawasaki Advanced Coactive Braking Technology (K-ACT) enabling riders to execute controlled, balanced braking. Available on the ABS equipped Voyager, the new system is designed to complement the rider’s braking inputs, and utilizes control valves to distribute the ideal amount of brake force for maximum stopping performance. With input from pressure and speed sensors, the brake ECU sends directions to the motor-driven hydraulic pumps so they deliver the proper amount of pressure to the brake calipers. This speed sensitive system provides a progressive engagement and disengagement that delivers a natural feel to the rider. With the anti-lock braking (ABS) function incorporated into the K-ACT, the wheels are prevented from locking up, even under strenuous braking. For maximum control in tight corners and when executing parking lot maneuvers, K-ACT’s coactive function does not engage when braking is initiated at speeds below 12mph and the ABS function is automatically disengaged at speeds below 4mph. Two robust 300mm front disc brakes with four-piston calipers and a single rear disc brake with a two-piston caliper provide the stopping muscle. More unique technology is found in Kawasaki’s new fully electronic throttle valve system which makes its debut on the all-new Voyager. Working with the rest of the fuel injection system, the electronic throttle valve offers a smooth, natural engine response. It also helps the ECU to deliver an ultra-precise metering of both fuel and intake airflow to the engine and helps provide accurate cold-engine idle speed control, reduced rider fatigue and a “natural” throttle feel. 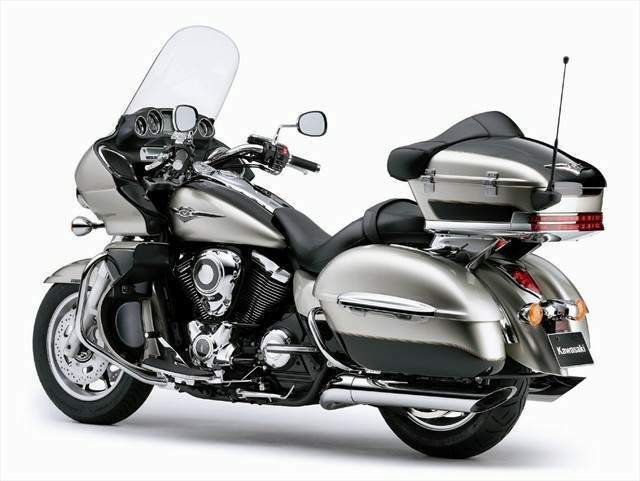 The Voyager’s light, compact frame holds a newly designed 1700cc V-twin engine based on that of the Vulcan 2000. However, it uses a single overhead cam in each cylinder head, rather than push-rod actuated OHV arrangement. This permits higher revs and quick acceleration from the new engine – delivering superior passing performance at highway speeds. The new engine’s compression and displacement increase, and long-stroke design delivers significant torque and power gains over its predecessor. This is no V-twin from yesteryear. The Voyager’s fuel injection system, like those in use on Kawasaki’s Ninja® 650R and Vulcan 900 motorcycles, utilizes one sensor in place of the usual three for less complexity and weight. Besides the obvious advantages of FI like improved fuel economy, the system also permits easy hands-off warm-up and idle control. The Voyager’s FI and exhaust are tuned to deliver its peak torque and horsepower at higher rpm – ideal for its open road operating environment. More touring refinement comes from the clutch, which features six damping springs and progressive three-stage damping for smoother torque delivery and easier shifting from the big 1700cc engine under hard acceleration. Kawasaki’s latest innovative technology is matched with essential touring features like cruise control and a six-speed transmission with overdrive fifth and sixth gears. The cruise control is conveniently operated from the right side of the handlebar and can be activated between 30 and 85 mph in third gear or above. Disengagement is easily accomplished by using the brake lever, clutch lever, rear brake pedal or closing the throttle. The new six-speed transmission features overdrive and a super strong carbon fiber drive belt. The tall fifth and sixth gears contribute to relaxed riding and better fuel economy at highway speeds. The new carbon fiber drive belt has a 40-percent higher tensile strength than current Kevlar units, and allows it to use a thin and light 28mm belt that helps keep the width of the Voyager to a minimum. The Voyager supplies superior protection from the wind and the elements thanks to a large frame-mounted windshield and front fairing, as well as leg shields. Mounting the fairing to the frame transfers any wind buffeting to the bike rather than the handlebars, reducing rider fatigue on long trips. Airflow to the lower extremities can be adjusted via air vents in the leg shields. Nothing needs to be left behind thanks to the color-matched, top-mounted 13.2 gal (50L) lockable trunk – large enough to fit two large full-face helmets – and the sealed and lockable, top-opening saddlebags offer another 8.6 gal (38L) of volume each. Besides this ample storage, the Voyager also has lockable glove boxes up front providing a handy place for storing small items and accessories. An iPod player jack (optional iPod accessory connector required) is located in the left-side glove box. Comfortable seating for the rider and passenger is a must on a touring bike and the Voyager delivers again with plush deluxe seats that are sculpted for all-day comfort. Contributing to long-distance passenger comfort is a luxury backrest with integrated passenger grab bars and floorboards for both the rider and passenger. Advancing the riding comforts to the next level are the instruments and built-in radio on the Voyager’s classic automotive style console. The image is reinforced by the classic font used on the large round dials of the instrumentation and the radio that’s reminiscent of 8-track players from the 1960s. Mixed in with the retro analog dials is a multi-function LCD display in the center of the instrument console. It’s controlled by switches on the right handle and features a gear position indicator, clock, odometer, dual trip meters, remaining range and average fuel consumption. The intercom headset-compatible, 40W, twin-speaker audio system features a three-band (FM/AM/WX) radio that is also compatible with an iPod, a XM radio tuner or a CB radio unit. The audio system (and iPod) can be operated by an integrated controller on the left handlebar. Besides volume, the rider can adjust the bass, treble and balance levels of the system. The Voyager also features a water-cooled alternator with rare-earth magnets that produces an impressive 48.5 amps of electrical output; enough to power add-on navigation systems and other electrical accessories that enrich modern touring. The Voyager has a convenient cigarette lighter-style power port on the dash and two power outlets under the seat – ideal for plugging in electrically heated vests. The designers were able to infuse the abundant technology into the new Vulcan 1700 Voyager with the presence and visual appeal expected of a Kawasaki flagship. Like the dashboard, the Voyager’s bodywork continues the 60’s muscle car inspiration with its study of muscular curvature. The meticulous attention to detail and exquisite craftsmanship expended on both bodywork and engine covers is revealed in the contoured forms that look good from any angle and are as pleasing to the touch as they are to the eye. Designed from the start to be as light and slim as possible, the new single backbone double cradle frame uses the minimal amount of forged parts and metal for a reduction of 4.4 pounds and a 40-percent increase in rigidity. With a shorter seat to steering head distance, the new lightweight chassis is more compact and shorter overall with a corresponding decrease in wheelbase. The easy-to-reach handlebars facilitate better low-speed maneuvering and contribute to greater rider confidence and comfort. Adding to the light and easy handling of the new chassis design are the new suspension components, which are tuned to match the Vulcan 1700 Voyager’s touring performance. Dual adjustable rear air-shocks provide 3.1 inches of travel, and include air adjustable spring preload and rebound adjustment to ensure a comfortable ride feel with unique settings for the Voyager. Up front, a large 45mm fork offers four-way preload adjustment, 5.5 inches of travel and promotes precise steering feedback. The Voyager rolls on new nine-spoke cast wheels, which use tubeless tires and complement its new muscular styling. Mounted on the attractive wheels are a 130/90 front radial tire and a wide, 170/70 rear radial tire. These aren’t the giant size tires that can "dull" handling, but beefy treads that offer good traction, smooth ride and good style. 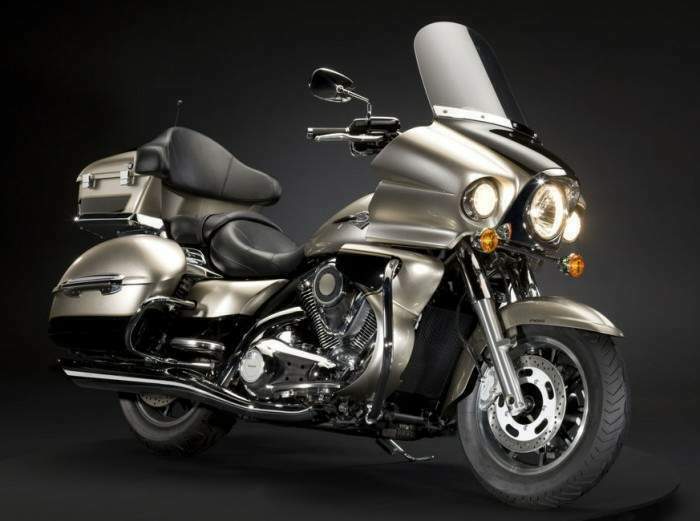 Offering a stylish alternative to traditional V-Twin tourers, the new Vulcan 1700 Voyager combines Kawasaki reliability with the performance, comfort and amenities that long-distance touring riders demand.